A good marketer’s skills can only take you so far. These days, if you want to achieve content marketing success, you have to use tools. While there are many tools that claim to “do it all,” the truth of the matter is that no single tool meets every need. The best way to achieve the most effective results is to use a variety of content marketing tools to get you where you need to go. At the same time, you don’t have to spend a ton of money to make it all work. 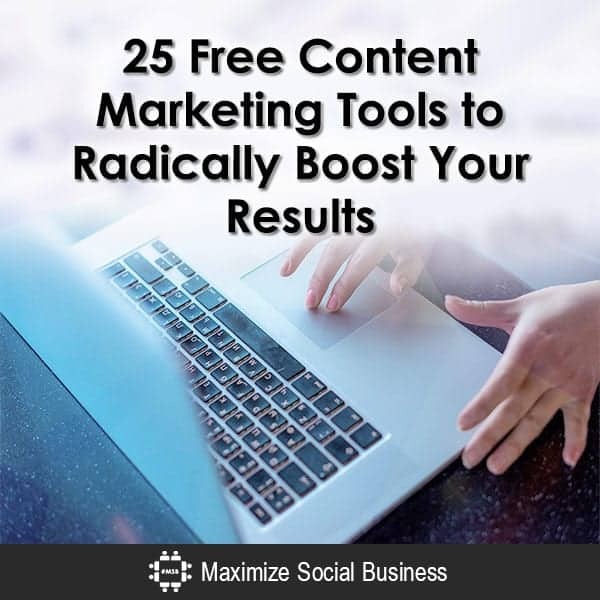 There are tons of free tools available to jumpstart your content marketing efforts. Below is a list of some of the fantastic free content marketing tools I use every week. I love writing – it’s my passion. However, even though I consider myself to be pretty skilled in using the magic of the written word, even I need some help to perfect my efforts. Notes – Use Notes to write down content ideas when they occur to you and later you can flesh out the full pieces (it’s basic but it works!). Bubbl.us – Develop a mindmap to sketch out your articles or your content marketing campaigns. Google docs – Use Google docs to collaborate with ease. CoSchedule’s Headline Analyzer – Edit your headlines until they become eye-catching masterpieces. Hemmingway – Improve your writing – as you write! I will fully admit that I am not spectacularly graphically inclined (though I can draw a mean stick figure). That’s no excuse for not adding engaging graphics to my pieces. After all, there are multiple free content marketing tools out there to provide help to those who are not graphic super stars. Atlas – Search for charts, research, and data visualization to add depth to your content. Unsplash – Pull down awesome free pictures that you can use however you like with no attribution. Canva – Put together anything from slides to social media graphics to infographics in a jiffy. Write Behind – Add words to your graphics and make it look like the letters are going partially behind the pictures (such a simple yet cool effect!). PicStitch – Put multiple pictures together to make a fun collage. Adobe Spark – Create impactful graphics even if you aren’t at all graphically skilled. Evernote’s Skitch – Annotate your pictures and screen shots with arrows, highlights, check marks, and more. For a more complete list, check out this list of top social media graphics tools. From videos to podcasts to presentations to quizzes – there are so many cool ways you can repurpose and then share content! Don’t just stick to the written word or cat pictures. Qzzr – Add quizzes to your content arsenal for a pinch of fun. Videolicious – Produce short videos – complete with narration and music – in minutes, using only your phone. Prezi – Easily develop presentations that are more awesome than any presentation you’ve ever created before. SurveyMonkey – Survey folks before you create your content and share the results. Create a survey that visitors can do while they check out your content and then email them the results. Skype – Hold and record long-distance, voice-only interviews for podcasts using Skype. Freesound – Add noises and music to your videos and podcasts using these sounds (but please provide attribution). My favorite social sharing sites include Facebook, Twitter, Pinterest, and Medium, but of course there are a gazillion other options out there. Choose the social media channels that work best for your business. Then use your free content marketing tools to quickly and easily share your content and convince others to share as well. Buffer – Plan out your automated social media posts ahead of time. HootSuite – Use this dashboard to monitor social media activity, share your content, and respond to folks in real time across social media platforms. Commun.it – Discover new ways to engage with your audience. Bit.ly – There are loads of link shorteners, but this is my personal favorite. SumoMe – SumoMe has a lot of free tools that you can add to your website to encourage people to download and check out your content, as well as share it socially. Twitter Lists – Use Twitter lists for creating groups of people who are interested in the topics about which you want to aim your content marketing efforts. Click to Tweet – Try this great content marketing tool to easily add links to your pieces, so readers can quickly Tweet out the quotes you want them to share. Just starting out in content marketing? Take a look at Kissmetric’s article, 50 Tools to Jumpstart Your Content Marketing Efforts. For a wide range of tools to enhance content marketing and more, check out Glance Networks’ infographic and article, Your Must-Have Marketing Toolkit for Awesome Self-Service, Responsive, and Live Marketing Programs. For blog post promotion, try 5 Tools to Effectively Promote Your Blog Posts. Here’s a huge list of tools to help your content marketing efforts, make your way through the fantastic resources listed in the Social Media Tools for Business Buyer’s Guide. Check out this broad range of content marketing tools, both paid and free, try Curata’s article and infographic, Content Marketing Tools: The Ultimate List. Got other suggestions for cool content marketing tool collections? Have other content marketing tools that you simply can’t live without? Let me know about them in the comments below or Tweet me up @HollyChessman. Hey Holly, great list of tools. Your enhancement tools list was a kind of surprise gift as I was looking for some social media tools. I'd request you to check out Smm.AI: https://smm.ai/, it is a social media content curation and planner tool. In Smm.AI's dashboard you will get quality content according to the specific industry and interest. You can directly schedule it for the social media profiles or sent it as an email. Social media and digital agencies along with social media freelancers can easily manage multiple of social media profiles using Smm.AI. Thanks for sharing this resources, I have been using HootSuite till date and it’s glad to know about many other tool available for social media.Surely looking forward to use this tool in coming days. these are some great content marketing resources of the tool which are available in the market to promote content.surely will be going to use this tool to promote the content of my sites.thanks for sharing such an informative post. Hi, Holly! Thanks for your contribution! You help many people sharing tools like these! I am using MassPlanner to automate social media and works great. Also, I would add Trello as a tool for organizing your social media tasks and activities.